Tulips are one of the most popular and most beautiful flowers in the world. There are more than 150 species and 3,000 different varieties. The term Tulip has been derived from a Persian word called delband, which means turban. It is believed that the flower was called this because of its turban-shaped nature. Tulips flowers grow from bulbs. They usually bloom in spring. They plants are perennial which means they live for more than two years. The flowers are native to mountainous areas so they need a period of cold dormancy, known as vernalization. The flower buds of tulips are known for being almost perfectly symmetrical. The flowers are shaped like a cup and it consists of three petals and three sepals. 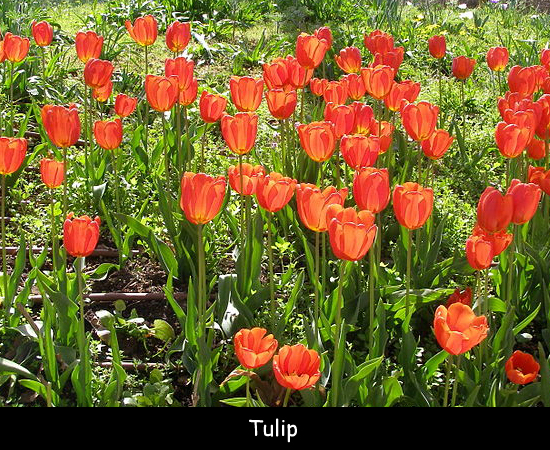 Tulips can be found in almost any color and different colors have different meanings. They will bend and twist to grow towards light even when placed in a vase. It is the national flower of Turkey and Afghanistan. Their petals are totally edible and can be used in place of onions in many recipes. In order for a tulip bulb to blossom in the springtime, it must be planted in the summer months. Carolus Clusius was the first person to identify a viral infection known as ‘broken tulips’. The world’s largest producer and exporter of tulips is Holland. Declan, Tobin. " Tulip Facts for Kids ." Easy Science for Kids, Apr 2019. Web. 26 Apr 2019. < https://easyscienceforkids.com/tulip-facts/ >.